Before Keaton Docchio graduated from Stetson University, he already had landed a job as a financial analyst with Lockheed Martin. Docchio connected with the aerospace company at a Stetson career fair last October on campus. 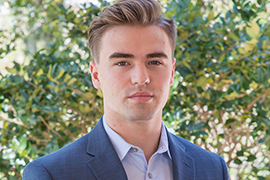 The finance major had interned with a Pittsburgh bank as a financial controller and was part of Stetson’s Roland George Investments Program, where students manage a $3.5 million portfolio of stocks and bonds. Docchio transferred to Stetson in 2016 from the University of Central Florida because he said his experience at the bigger school wasn’t adding up. 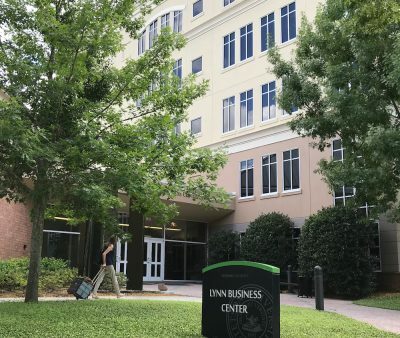 The Stetson School of Business Administration is housed in the Lynn Business Center. Docchio grew up in a small Pennsylvania town, so he felt more at home at Stetson and in DeLand. The one-on-one attention from professors at Stetson was tremendously important to his success. In addition to Stetson’s strong sense of community, Docchio said the business school’s reputation for strong academics was also a major factor in his decision to transfer. 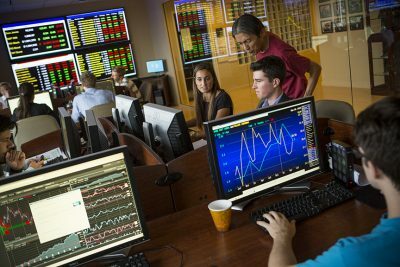 Students in the Roland George Investments Program manage a $3.5 million portfolio. His role with Stetson’s innovative Roland George Investments Program – one of the nation’s oldest and best student-directed investment program – allowed him hand-on experience managing a real portfolio made up of $3.5 million in stocks and bonds. The Stetson University core values of community, inclusion and personalized attention are what propelled him personally and professionally. And thanks to the job fair on campus last fall, he had an impressive job waiting for him upon graduation.